1. Where can I buy groceries and liquor? Pan Santos Bakery. Delicious and fresh breads, cookies, cakes, donuts and sandwiches. Aborrates Imelda. Buy beer, liquor, ice and a variety of canned foods here. Fair selection of stationary products. Wireless internet and payphone. Tortilleria. Buy freshly made corn tortillas. If you prefer flour tortillas, go next door to Aborrates Imelda. Aborrates Terisita. Good smoked pork chops usually available and some hardware like nails, bike parts, plastic buckets and dishes. Also buy fish food here in the big garbage cans behind the counter (“alimentos para pollos”). Fresh Fruit/Limes You can get some fresh fruit in Pedro Santos but if you are driving you might as well go the extra 10km into Los Limones as the fruit and vegetable store near the north end of town has the biggest selection..
Bacalar: The closest ATM is the town of Bacalar, 45 minutes by car. At the first gas station as you enter Bacalar from the north end . Use the ATM inside the store. There are also ATM machines located on the town square. There is no bank or money exchanger (“Cambio”) in Bacalar. Just past “km 22″ turn left at the sign “Bacalar Salida 500m.” Turn left one street past the big white church downtown. Make the first left again and you will see the town square and the ATM kiosk on the right. Bus Station. There is an ATM at the big bus station near the San Francisco grocery store. The Big Mall on Insurrengtes Ave. Bank & ATM located in the center of the mall. Access is from the outside (front) of the Mall. Obregon at Juarez. There are two banks where Juarez crosses Obregon. The Bital bank has an ATM. There are lots of banks and money changers in Chetumal, too numerous to list. Most of the money changers are on Heroes Ave., the main street going through town, connecting Insurrengtes and Obregon. Felipe Carrillo Puerto. There’s a bank and ATM at the Pemex station on the left as you are entering Felipe Carrillo Puerto, about an hour’s drive from Pedro Santos. Tulum. There is also a bank & ATM and “Cambios” in Tulum (about 2 hours north of Pedro Santos). Mahajual. There is no bank, ATM or Cambio yet at Mahajual. 3. What restaurants are nearby? 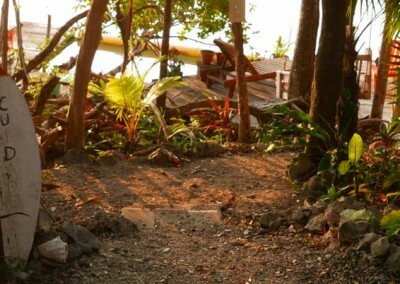 Pina (1 km south of Pedro) is a good breakfast and lunch restaurant. They also have a small gift shop and tours of the pineapple fields. Buenavista (10 km south) has a nice fish restaurant located at the Balnerio (public lakeside park) and also a restaurant on the highway. 4. Where is the nearest Phone, Internet & Fax? In Pedro Santos 4km away you can make a phone call from Aborrates Terisita or Arborratas Imelda, where there is also WIFI. Limones (10 km). You can make a phone call or send a fax from “Telephonica Casita” which is also a grocery store. This store is located on the south side of the town square on Highway 307. 5. Where are the closest Mayan Ruins? Chacchoben. (12 kilometers) Due to its proximity to the new cruise ship dock in Mahajual, this is the second most visited ruins in the Yucatan (Chichen Itza, located between Cancun and Merida, is #1). Go south on highway 307 and make the first right to Merida (Hwy. 293). Follow the signs. On the left. Kohunlich. Drive time approx. 1 ½ hours. Go south on highway 307 about 35 miles (57km) and turn right on the road to Escarcega (Hwy. 186). Go another 30 miles (50km) and turn left. Watch for the signs. Very beautiful setting. Usually very few people. You might be the only one there. Often you will see monkeys. Dzibanche. Drive time approx. 1½ hours. Go south on highway 307 about 35 miles (57km) and turn right on the road to Escarcega (Hwy. 186). Go another 38 miles (62km). On right. Watch for signs. Kinichna. About 1km past Dizibanche. Calakmul. About three hours away but well worth the drive. Follow the directions to Kohunlich. Keep going. On the left. Watch for the signs. 6. What are the best places to shop in Chetumal? The Market. The “old Mercado” in Chetumal is located beside the Mayan Cultural Museum and across the road from the Holiday Inn on Heroes Ave. You can buy T-shirts and hammocks, blenders and shoes, papayas and fresh pork in this big indoor market. There are also plenty of little restaurants inside serving typical Mexican fast foods. Try the “salbutes” and the “empanadas.” Delicious! Chedraui. Big store at “the mall” with a good selection of vegetables, meats and canned goods. They might have soy milk. Ask for “leche de soya.” Also has a farmacia. Sells dishes, towels, clothes, and electronics as well. The Bodega. This store has the look and feel of a Walmart. Includes a grocery store with a great selection of cheeses. You can buy everything from washing machines to underwear here. Located on Insurrengtes not far from the big Mall with the MacDonald’s. The Big Mall on Insurengtes Ave. MacDonalds, Office Depot, Liverpool (high price department store with everything from electronics to dishes), Kodak store with kiosk for printing photos from CD’s or flashcards, bank and ATM, Chedraui (groceries and misc. ), movie theatre, restaurants, gift shops and many others. 7. How does solar power work? Lights are powered by 12 volt, “deep-cycle” batteries. Each day the sun hits the solar panel and charges this battery. Unlike the 110 volt A/C system you have at home, this system does not provide unlimited electricity. Use of fans, hair dryers, electric shavers or any heating appliances is not possible. If you leave the lights on all the time, you will run down the charge on the battery, your lights will dim and eventually go out completely. The following morning, as soon as the sun hits the solar panel, you will have electricity to operate your computer and lights; however, some of that electricity is necessary to recharge the battery or your lights and computer will not work after the sun goes down that evening. IF you ran down the battery the night before (your lights dimmed and went out), give your battery a chance to recharge the following day for at least four hours. This means don’t use your lights, computer or other electronics for at least four hours during the day. A normal day usually provides eight hours of sunlight on the solar panel. 8. Where can I buy Gas for my Car? The closest Pemex station is located on Hwy 307 2km south of Pedro Santos. Mahajual at the Pemex station. Mahajual is about 55 km from Pedro Santos (45 minutes by car). Bacalar at the Pemex station on Highway 307. Chetumal at the Pemex station on the left just past the glorietta to Belize. About 85km from Pedro Santos. Felipe Carrillo Puerto at the Pemex station about an hour’s drive north from Pedro Santos. 9. Where do I check in? 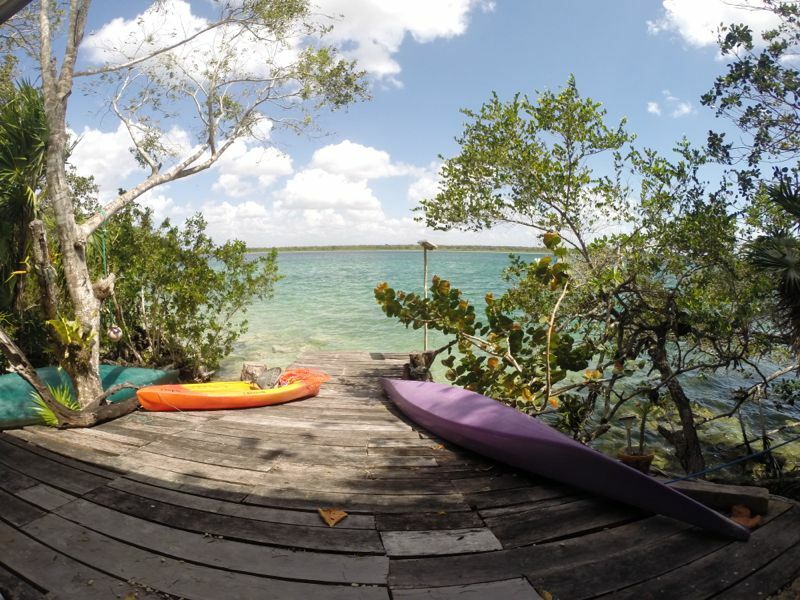 For Mis Casas at the end (T junction) of the main road in from the highway turn right (you would go left for the Maya Lagoon Resort and Laguna Azul Campground) and continue about 1km until you reach Lot 44, Mis Casas. Ask for Katarina. 10. Are Credit Cards Accepted? Once you are in Mexico, you cannot charge food, accommodations or services at many of these vacation locations at the north end of Laguna Bacalar. It’s best to change your currency into Pesos in Cancun or in Playa del Carmen or Tulum on your way down from the airport. You can also get pesos from International Foreign Exchanges in your home city. You can also pay in US cash (non-tattered bills only). Pesos are preferred and the only currency accepted in all the small stores. 13. Where is the nearest airport? 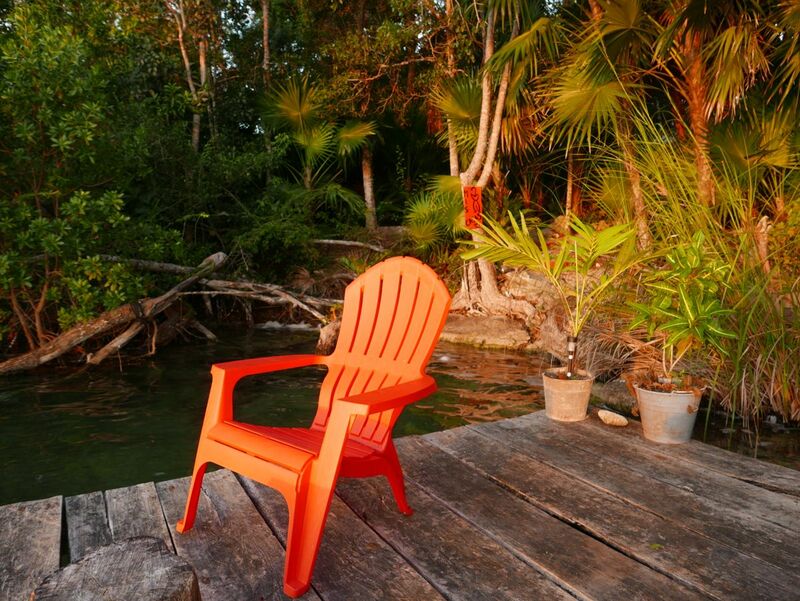 Chetumal, about 50 miles from these accommodations, is the nearest airport. The Chetumal airport is lengthening its runways in preparation to becoming an international airport. Cancun is currently the nearest international airport in Mexico. Cancun is about a four-hour drive from these accommodations. Belize City also has an international airport. 14. What is the bus service like? Like in most areas of Mexico, public transit is inexpensive, frequent and used by many. From Cancun Airport you can take a bus into downtown Cancun or south to Playa del Carmen. From both these locations you can catch a second class Mayab bus heading south. There is also an ADO bus from the airport to Playa del Carmen, where you can take a “Combi” collectivo south to Felipe Carrillo Puerto, and another one to Pedro Santos, and then a taxi to Mis Casas. Ask the driver to stop at the bus stop (or Bakery) in Pedro Santos (10km south of Los Limones) and 35km north of Bacalar. 15. What are some web sites to refer to for more information on the area? 16. 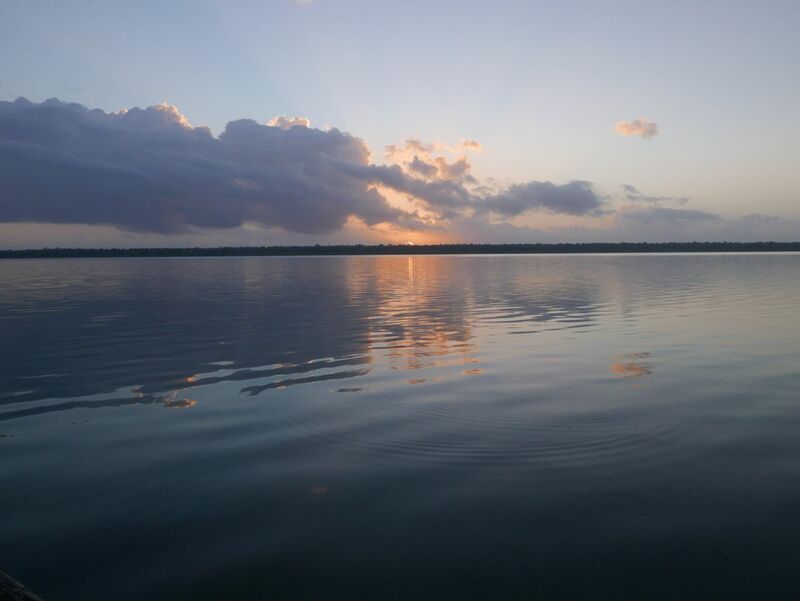 Is Laguna Bacalar a fresh or salt -water body of water? 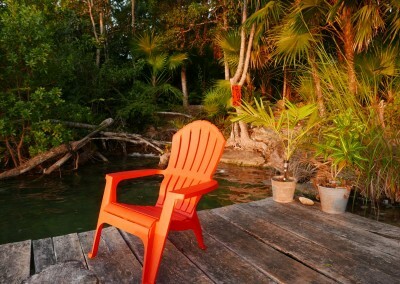 Laguna Bacalar (known as the Lake of Seven Colurs) is the second largest lake in Mexico after Lake Chapala. It is 55 km in length, stretching from Pedro Santos in the north to past the town of Bacalar going south. 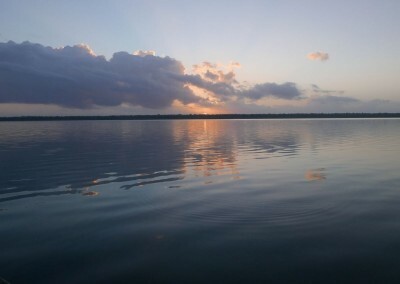 Eventually the lake through its tributary status flows into the Rio Hondo, which empties in the Bay of Chetumal (Carribean Sea). The lake is cenote or underground fed as opposed to “above ground” river fed. Hundreds of underground springs keep the lake fresh and the water “sweet”…..closer to the sea evidence of salination occurs. Ready to come visit us? Please contact us and let us know what dates you are interested in.